Skype 7.18 has been released. It will be some days when you will be automatically be upgraded to the latest version. The current version of Skype is v7.17.0.105. 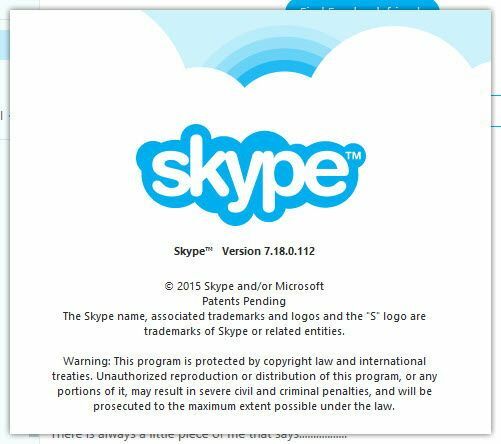 If you want to upgrade to the latest version of Skype, you can use our direct download links to the latest Skype 7.18 installers. We will provide all kinds of installers including the standard offline installer, the silent installer and the portable version of Skype 7.18. Skype account can also be accessed from the web. If you do not want to install Skype for any reason or you want to use Skype on a public computer, you can always go to login.skype.com and login to Skype without downloading or installing anything on the computer. You can also connect Facebook with Skype. Skype will automatically extract information from your timeline and display it on the Skype home window. You can also update your Facebook status, chat with your Facebook friends using the Skype application. If you are a systems/network administrator, you may download the MSI file or the silent install file which will make it very easy to deploy the latest Skype across the network of PCs. Please note that you will need the MSI file for installing Skype silently. Is this the latest version of Skype?